The “Azerbaijan Caspian Shipping” Closed Joint-Stock Company was established by merging country’s two largest fleets – the Azerbaijan State Caspian Sea Shipping Company and the Caspian Sea ​​Oil Fleet of the State Oil Company of Azerbaijan Republic. The merger took place in accordance with Decree No.6 of the President of the Azerbaijan Republic, dated October 22, 2013, on establishing of the “Azerbaijan Caspian Shipping” Closed Joint-Stock Company and Decree No.213, dated January 10, 2014, on organizing of the work of the “Azerbaijan Caspian Shipping” Closed Joint-Stock Company. Two companies were merged in order to continue fundamental structural reforms in the economy, increase domestic and international transportation in maritime industry, enhance competitiveness and transit potential of Azerbaijan and get synergies from centralized management of the state owned shipping companies. The “Azerbaijan Caspian Shipping” CJSC is comprised of the offshore support and merchant fleets and two shipyards. The merchant fleet consists of 51 vessels: 20 tankers, 13 ferries, 15 universal dry-cargo, 2 Ro-Ro ships as well as 1 auxuliary vessel and 1 floating workshop. The offshore support fleet is comprised of 210 vessels: 20 crane vessels, 25 supply and tug vessels, 26 passenger ships, 2 pipelay barges, 6 firefighting vessels, 7 geological survey vessels, 2 diving support vessels, and 88 other support vessels. The “Azerbaijan Caspian Shipping” CJSC plays connecting role in the Transport Corridor Europe-Caucasus-Asia (TRACECA), provides marine transportation of goods and passengers along with Trans-Caspian Sea as well as provides offshore support services for oil and gas operations. The development of marine shipping in Azerbaijan is closely linked to emergence and enhancement of the oil industry. The rapid growth of oil production in Baku in the nineteenth century gave impulse to the development of shipping industry in the Caspian Sea. Naturally, at that time, new vessels were required for transportation of oil and oil products. It is no coincidence that the world’s first oil barge “Alexander” was operated in the Caspian Sea in 1873. 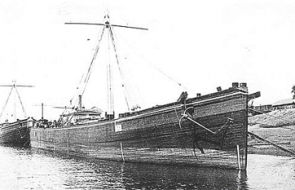 The first tanker in the world – “Zoroaster” (built in 1878) was voyaging to the Caspian Sea. The first internal combustion engine “Vandal” (1903) and the first two reversible motor “Delo” (1908) ships were also fortuned to the Caspian Sea sailors. The Caspian Shipping Company was founded on May 21, 1858 by establishment of “The Caucasus and Mercury” Joint-Stock Company. As the volume of cargo transported by sea was increasing, the number of ports on the shores of the Caspian Sea was also rising. New bridges, warehouses and cranes were built. 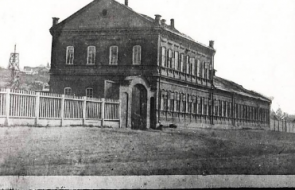 Expansion of the fleet also enforced the establishment of ship repair facility, and in 1866, the foundation of the Mechanical Plant of “The Caucasus and Mercury” Joint-Stock Company was laid in Baku. 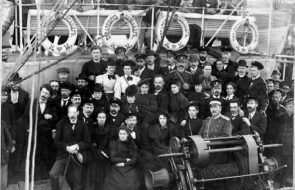 In order to meet the staffing requirements of the emerging fleet, Baku Seamen classes were organized in 1881. In subsequent years, the company’s fleet was upgraded with new types of vessels built in Azerbaijan and abroad. 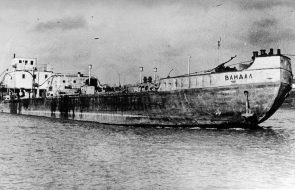 The Caspian sailors were provided with river-sea tankers and cargo ships. In 1962, Baku-Turkmenbashi ferry route was put into operation based on the design by the specialists of the Design-Research and Scientific-Investigation Institute of Caspian Sea Transport (currently division of “Azerbaijan Caspian Shipping” CJSC), which was the largest in Europe at the time. Since 1960, vessels of the Caspian Shipping Company started sailing to international waters via the Volga- Baltic Channel. The Caspian Sea Oil Fleet also has successful history of operations that spans over more than 60 years. By the Decree of the USSR Council of Ministers, dated 31 October, 1949, “On Development of Offshore Oil Production in the Caspian Sea”, “Azerneft” Production Organisation, and by Order of the USSR Ministry of Oil Industry, dated November 4, 1949, in “Azerneft” Production Organisation’s structure, the “Floating Crafts” Division was established. The development of the Caspian Sea Oil Fleet began from that date. 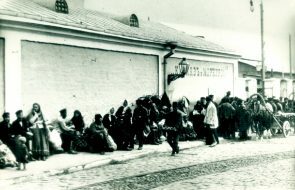 At that time, the floating crafts of “Artyomneft” and “Stalinneft” offshore drilling departments were transferred to ownership of the newly established organisation. 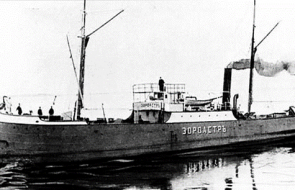 These mainly were “Transportnik”, “Gabala”, “BMK-90” type small boats, 20 tons floating cranes and barges. By the Order of the USSR Ministry of Oil Industry, dated January 22, 1953, the “Floating Crafts” Division was remade into Caspian Sea Oil Fleet. Today, the “Azerbaijan Caspian Shipping” Closed Joint-Stock Company is committed to fulfilling tasks at a high level combining the maritime fleets in a single entity.